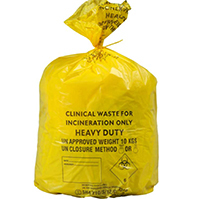 Yellow clinical waste bags for disposal of infectious waste containing chemicals or pharmaceutical medicines. Suitable for category A waste including disposal of items contaminated with VHF type illnesses, including Ebola (rare in UK). Suitable for Infectious waste including swabs & dressings, soiled cotton wool, tissues & blue roll/couch roll, soiled gloves and aprons, incontinence pads and nappies. IV lines and fluid bags contaminated with pharmaceutical medicines, syringe bodies and disposable metallic parts.